Concert of Ganesh Del Vescovo Friday 13 October 2017 at 9:00 p.m, Church of S. Lorenzo a Vicchio di Rimaggio, Bagno a Ripoli (Fi), music of Couperin (Passacaglia), Bach (Suite 996) Mozart (12 Variazioni su Ah,vous dirais-je,Maman) and Del Vescovo,more info in Concerts and events.
. Fiori Musicali - Concert of Ganesh Del Vescovo saturday 20 May 2017 at 8:00 p.m: Sala concerto del Centro Studi Musica e Arte - via Pietrapiana 32, Florence Dedicated to Manuel de Falla, music of Couperin, Bach, Torroba, de Falla, Del Vescovo...click on the Concerts. 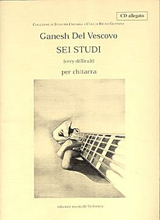 Guitar recital of Ganesh Del Vescovo , VIII Concorso Internazionale di Liuteria - Sunday 21 May 2017 ore 5:00 p.m, Sala Pilade Biondi del Palazzo Comunale di Sesto Fiorentino, free admission, click on the Concerts. Masterclass of Ganesh del Vescovo, Saturday 3 June 2017, from 10 A.M. to 1 P.M e dalle 3 P.M. alle 7 P.M presso la sede di “DoReMi”, International Musical Academy (D.I.M.A), siti nei locali parrocchiali della Parrocchia di San Gemignano ad Arezzo. La masterclass sara` seguita dal concerto mattutino di domenica 4 alle ore 11 nella Chiesa di Santa Maria della Porta (Chiesa di Porta Crucifera) ad Arezzo, for info click on the Concerts. I am very happy to announce that i won the 11th INTERNATIONAL COMPOSITION COMPETITION FOR CLASSICAL GUITAR MICHELE PITTALUGA with the piece for two guitars entitled Improvviso e Ritmico...click on the News. Guitar Recital : Ganesh Del Vescovo Saturday 24 September 2016 at 7:00 p.m.,Church of S.Eligio degli Orefici - via di S. Eligio 7, Rome, Music of Villa-Lobos, Torroba, Couperin, Rodrigo, Del Vescovo. You now can subscribe to the splendid monografic guide of Ganesh Del Vescovo "The Guitar without Boundaries" in the series of Guitart publications. It consists of 144 pages both in Italian and in English, and is dedicated to the unlimited number techniques possible in composing for the guitar + It includes a CD with 55 music tracks of examples... click on the News. Here is the interview (with the English translation) that the musicologist Eleonora Negri recently had with Ganesh Del Vescovo, published by the Magazine Guitart in the October/December 2015 issue. It also announces the manual which is about to be published with the title, "The Guitar Without Bounderies- A Guide to new technical possibilities of the guitar, for guitarists and composers" - Booklet + CD by Ganesh Del Vescovo, click on the News. for the program)...An interesting Web "Conversation with Ganesh Del Vescovo" by Poireinganba Thanglam/Len has been published on the Web Magazine Classical Guitar Augmented,see the News...A CD dedicated to his music is being published by EMA Vinci with the title "Omaggio a Ganesh Del Vescovo". This CD will be presented at his Concert at the Lyceum Club Internazionale, via degli Alfani 49 Florence, 23 November 2015 at 8.30 P.M.
A recent interview made with Ganesh Del Vescovo by the musicologist Eleonora Negri will be published in the next issue of Guitart Magazine. The next issue of Guitart will publish the score of the music on the video Pioggia d'autunno by Ganesh Del Vescovo. 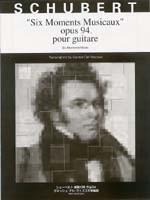 (see News for more info)...An important monographic “booklet” by the composer about his works on the guitar is about to be published by the magazine Guitart. 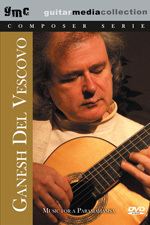 The entire works for guitar solo of Ganesh Del Vescovo are being prepared and will soon be published by Sinfonica, thus completing the works that have already been published. The works will consist in three volumes, each with an included CD.